The past few years have been difficult. In 2010 I re-trained as a primary teacher. I loved the course, even (or especially) when I found it challenging. Unfortunately, I picked a time when there were more teachers than positions and I have been unemployed (aside from some casual, non-teaching work) since then. I will admit to struggling with this situation and, at times, I felt like just giving up on the whole thing. I guess I couldn't stay away from schools though and kept on parent helping at my son's school and volunteering in a friend's classroom. Eventually, my friend suggested (quite firmly) that I put my name down to relieve at her school. I had always resisted the relieving option, partly because I was a little intimidated by the idea but mostly because I am not that great at learning names quickly and I feel like I am disrespecting the children whose names don't stick easily. Fortunately, I have good friends who push me when I need it and the upshot was I managed to get some days relieving at two different schools in the latter half of 2013, including one full week with the same class. It made me think that perhaps I could do this. Those experiences also made me realise that, to my surprise, I missed writing a reflective journal to help process my time in the classroom. And so this blog was born.The start of another year brings new beginnings and lots of good intentions. I am hoping this blog will be easier to stick to than a new diet! On a totally unrelated note (and only because I wanted to include a cute cat photo), in late 2013 we welcomed Rory the kitten to our family. His mum was a rescue cat and she and her kittens were fostered by a lovely family before making their way to new homes, one of which was ours. He is lively and loving and we adore him. 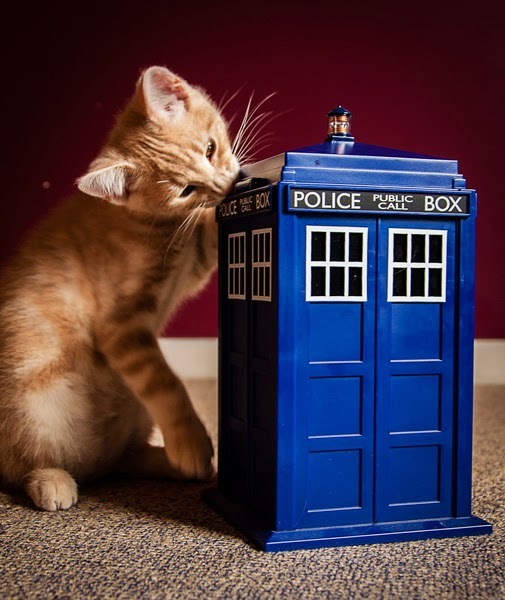 Rory the kitten with the Tardis. It is bigger on the inside.